From Nintendo Wii to Nespresso , Alexander Osterwalder proved his case. “A better business model almost always outcomes a better technology.” he pointed out, and also added in the case of Nespresso: “Business models also expire”. Pair work was to define business model. This created multiple different definitions. Then our task was to draw any business model. This way it was much easier and faster to deliver idea. Osterwalder pointed out the higher you go in the organization, the fewer white boards you can find. “Is there not anymore problems at top of the organizations?” he asked. Business meetings without visualization are called blah-blah-blah-meetings.People talk a lot, but without common understanding. “Even though how smart you are, words are not enough. You need to have a business model that opens up what you talk about.” explains Osterwalder and continues: “Sketching makes a business model tangible, makes it visible”. The Business Model Canvas is a tool developed by Osterwalder and Pigneur (2010), which helps organizations to understand, design and implement or enhance business models (Canvas can be downloaded for free). With nine building blocks, which are customer segments, value propositions, channels, customer relationships, revenue streams, key resources, key activities, key partnerships and cost structure, business model can be visualized in one canvas. Business models are never in void. They are in relation to the surroundings, where competitions exists. 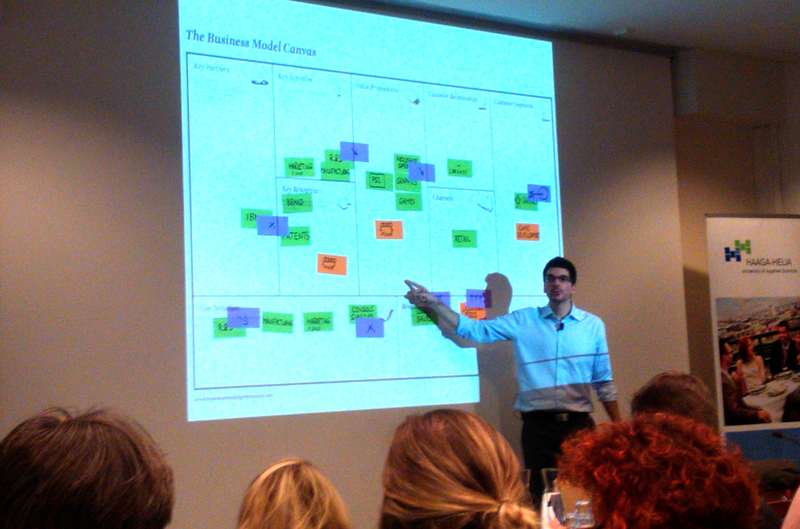 Center of the business model canvas is the value proposition. It should fulfill what kind of jobs customers wants to accomplish by hiring the job. 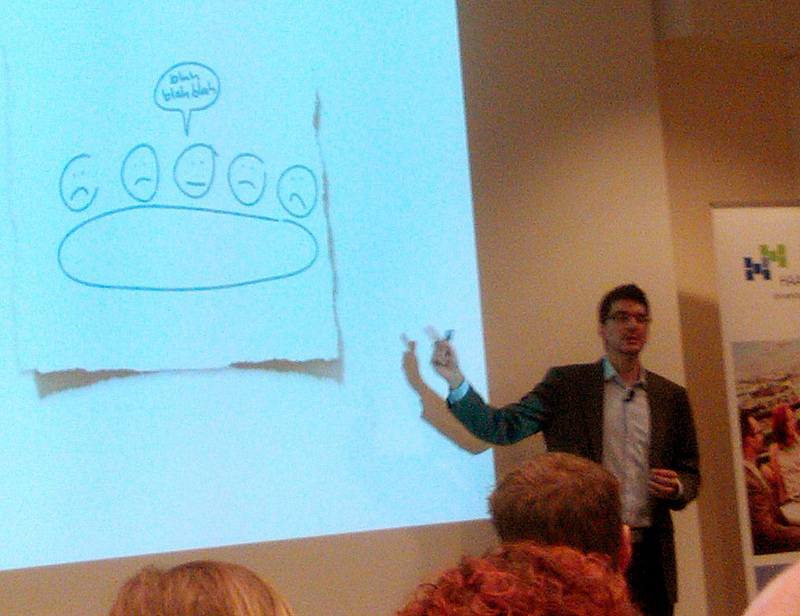 Is there a story in your business model? Business model carries a story throughout every building block of the business model. Companies can have more than one business model, but they have to fit together. Osterwalder pointed out Apple as an organization, which has many products, with different business models, but they are all linked together as one story where every piece is enhancing the entity. Designing is about solving problems. Designers create lot of sketches to address the problems, and from best ideas some sketches are prototyped and tested. If an idea does not work, it is abandoned. Because business models are designs as well, similar techniques can be applied. We tested this by sketching multiple business models in a short time and chose one idea to be prototyped. After our prototypes were ready and presented, Osterwalder ordered us to destroy them. You have to be ready to abandon designs you love. Therefore the ideas and prototypes can be quite blunt and not so well detailed yet. Afternoon co-founder of Finnish farmers market Eat & Joy Aki Arjala introduced us their business model with the facilitation of Alexander Osterwalder. Eat & Joy’s value proposition was local food and better food and in the customer segments were customers, who wanted better food. With the concept of better food Aki meant food made locally and made with love. The delivery chains were their own shops, events, other shops than their own shops and shop in shops. Eat&Joy purchases their products from local producers and they have also their own brand products. Their key activities were sales, logistics and also search of new products. Key partners for Eat & Joy are producers and customers. Expenses were rent based on revenue, rents and labor costs. Profits came from the sales margin. Final group rehearsal was to design a business model for Eat & Joy for their coming farmer market in Copenhagen airport. 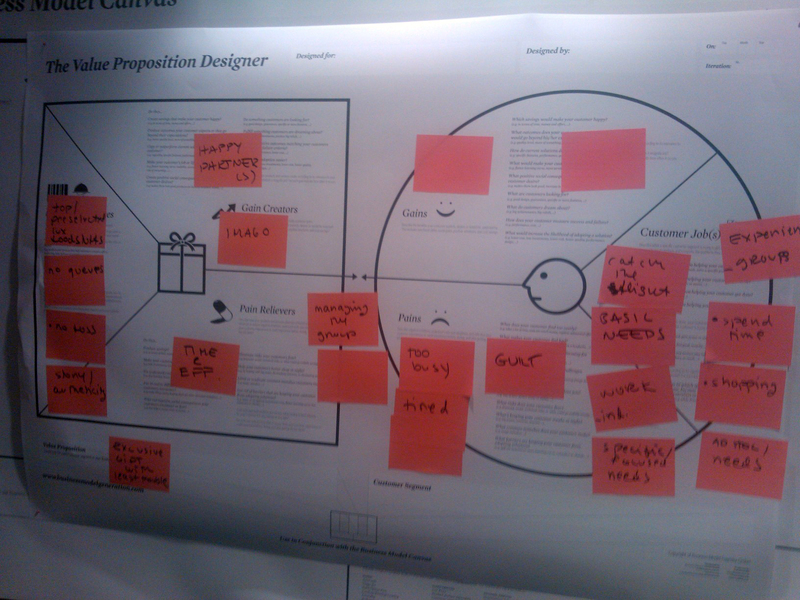 Task was to design a prototype for a service design by using both the Business Model Canvas, introduced above, and a new tool called Value Proposition Canvas. I don’t think about business models. Focus on products or value propositions alone. This level can be called as the oblivious. Level zero. We use business model canvas to see the big picture of the service, but it is more like a checklist, which customers to focus and how to target them. This level is can be called as the beginners. Level one. We design business models as a story, where every piece strengthens the story. They can be called as the masters of business model generation. Level two (cases: Wii & Dell). We are constantly seeking for new business models (even before there are changes in the market). These organizations are hard to beat and unstoppable, and can be called as the invincible. Level four (cases: Apple and Amazon). Text by Laurea SID student: Erkki Salo.